A few weeks ago, I attended an American Folklife Center symposium at the Library of Congress, celebrating the release of the new book Ola Belle Reed and Southern Mountain Music on the Mason Dixon Line by fellow folklorists Henry Glassie, Cliff Murphy, and Doug Peach. The book, which I highly recommend, is based on fieldwork by Glassie and Murphy and relates the story of a group of southern musical families who moved to Delaware, Maryland, and Pennsylvania in search of jobs during the Great Depression. Placing Ola Belle and her relatives and descendants at the center, it examines the community of southern traditional music that took hold there and its modern iterations, namely in the music of Danny Paisley and the Southern Grass, and Zane and Hugh Campbell. As a big fan of Ola Belle, Hugh, and Zane, as well as the book's authors, the symposium a lovely and insightful gathering. My one critique is that I wish there had been more women's voices on the stage. Upon talking about this with my coworker Greg, he suggested I get in touch with Judy Marti, a banjo player, orchardist and last student of Ola Belle's, who also self-published a biography of her that's often quoted in the new book. I emailed Judy and said I was interested in meeting her, learning about her music and farming, and possibly playing some tunes, and she invited my bandmate Nadia and me up to her orchard in Biglersville, PA on a Saturday afternoon. I wanted to make something to bring to Judy and her husband, and figuring they already had a glut of apples, my eye turned to the quart of Seckel pears I'd bought at the farmers' market the weekend prior. I don't believe I'd baked with them before, and felt they were so remarkable in their size and flavor, that I wanted to preserve and showcase that as much as possible. I remembered seeing a beautiful wine-poached pear recipe on David Lebovitz's blog and figured I could poach these mini pears whole and place them on individual tarts. I found a similar recipe via The Telegraph, and baked these Saturday morning after poaching the pears the night before. As usual, I was in a rush to finish baking before I head to drive up to Biglersville, but I made it out in time, and it was the perfect crisp and sunny fall day for a trip out of the city. When Nadia and I arrived, Judy took us for a tour of her orchard, which she called a "homestead farm," mostly supplying just enough for her and her family, plus some barter and sales. Then we sat on the deck of her sauna, and she showed us Ola Belle's distinctive picking technique, told us stories about their friendship, and we passed instruments around, sharing tunes with each other. In the end, I felt a little silly bringing pear tarts to an orchard (that it turns out, also grows pears), but after I left, Judy sent me an email, saying they were "quite good." 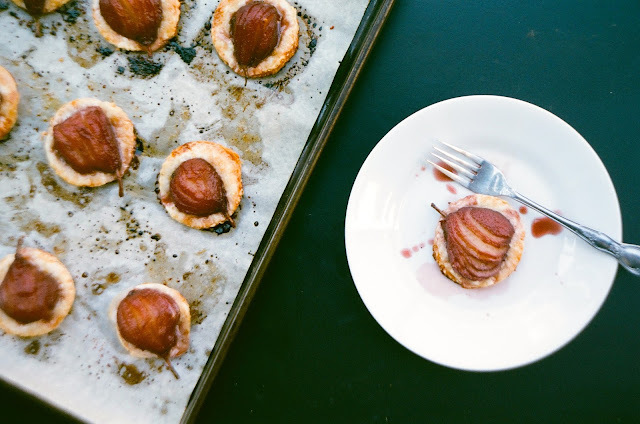 The tartlets would also do well paired with creme fraiche and could even be brought to the savory side of things with some thyme and goat cheese spread on the puff pastry prior to adding the poached pear. You can make it with store-bought puff pastry or homemade-- Food52 has a great and fairly easy recipe. 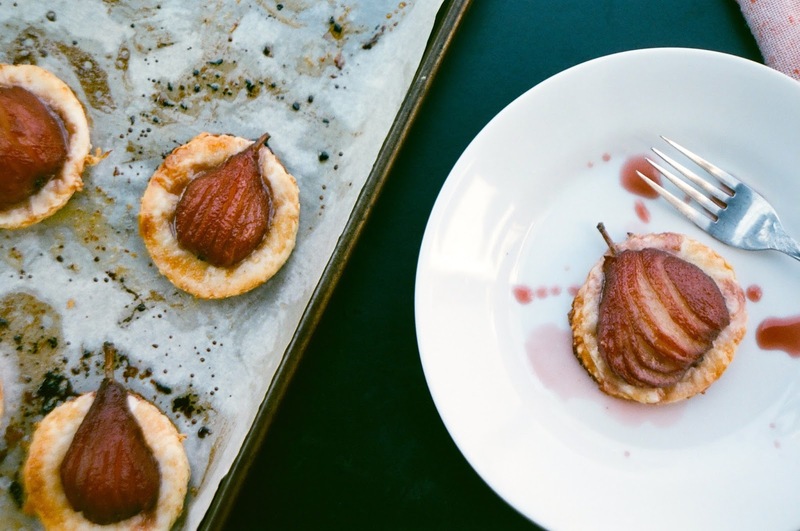 Either way, the tartlets would be wonderful as appetizers or dessert, for fall dinners or a fancy Thanksgiving feast. 1. Pour water and wine into a stock pot or saucepan large enough to hold all pears and whisk together with brown sugar. Hit on low, stirring occasionally until sugar dissolves. Add lemon rind, cinnamon stick and peppercorns and let simmer on very low-- do not let boil. 2. Meanwhile, peel pears without removing the stalks and place in the saucepan with the wine mixture. Bring liquid just to a boil, then reduce heat to a vert low simmer-- you want the fruit to cook slowly. Gently cook pears, turning them occasionally so every side comes into contact with the wine. They should be tender, but still hold together. Once tender, remove pan from heat and let cool. 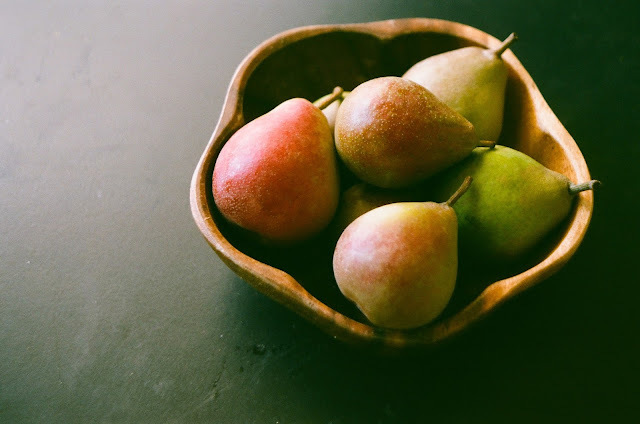 When at room temperature, transfer wine mixture and pears to a bowl, cover, and let sit in the refrigerator for 1-3 hours. This will allow the pears to absorb both color and flavor. 3. Preheat oven to 450 degrees F. Remove pears with a slotted spoon and place on a cutting board. Return wine mixture to pot or saucepan and boil until thick and syrupy. Remove from heat and let cool. 4. With a sharp chef's knife, make lengthwise cuts in pears, about 1 cm apart so slices can fan out slightly. 5. On a lightly floured surface, roll out puff pastry and cut into rounds with a biscuit cutter or glass just slightly larger than the pears. 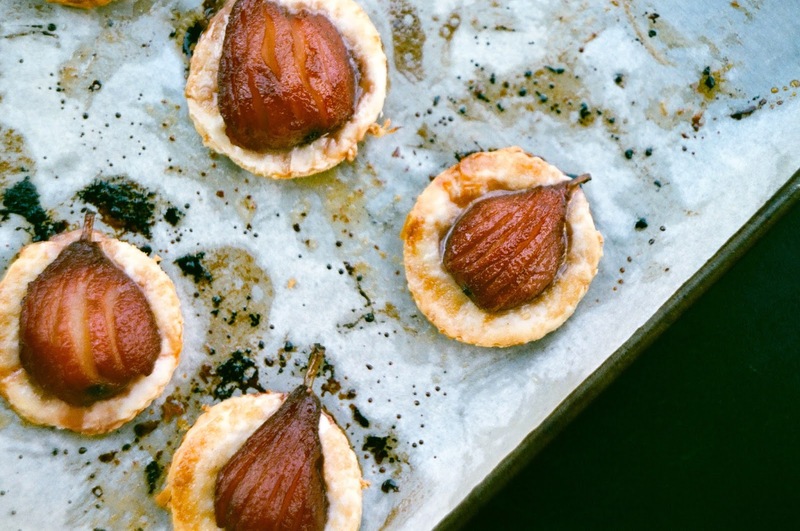 Place on parchment-lined baking sheet. 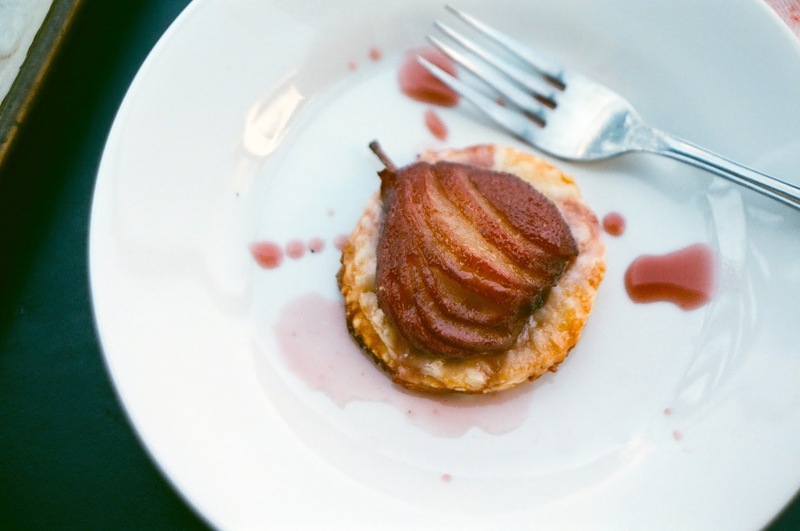 Brush each pastry round with melted butter, then place pear in the center of each round. Sprinkle with Turbinado sugar. 6. Bake at 450 for 8-10 minutes until pastry is puffed and golden. Serve tartlets individually with wine syrup drizzled atop. Labels: film, music, pear, pear tart, pennsylvania, red wine-poached pears, Red Wine-Poached Seckel Pear Tartlets, Washington D.C.